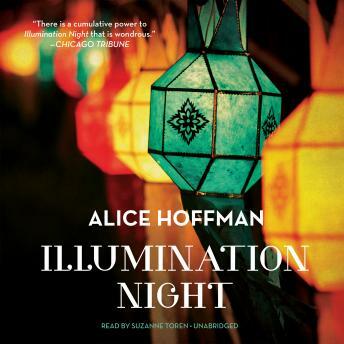 Beginning on the night of the Grand Illumination, a festival of lanterns held each summer on Martha’s Vineyard, this novel is a modern chronicle of a marriage and a bittersweet exploration of an extraordinary passion. Illumination Night follows the lives of a young blond giant who is as beautiful as he is frightening; an old woman at the end of her life whose last mission is to save her granddaughter’s soul; a family torn apart by a wife’s fears and a husband’s unrealized desires; and the high school girl who comes to Martha’s Vineyard against her will, who steals husbands and cars, and who will bring everyone together in a web of yearning, sin, and ultimate redemption. Both riveting and reflective, this is a story that brings to light the talent that has made Alice Hoffman an acclaimed bestselling author. Her characters are flawed, real and carry on like the rest of us. An excellent read! This is my favorite Alice Hoffman book!